If you are looking for a small SUV that offers better safety you better take a second look at Chevrolet Trax that has managed to get five star rating by Euro NCAP. Chevrolet said that they are really glad to receive the top safety rating by independent consumer organization European New Car Assessment Program. Chevrolet also said that this is their seventh Chevrolet model that has received the highest safety ratings. Chevrolet revealed that earlier Aveo, Volt, Cruze, Orlando, Malibu and Captiva have managed to get the same safety ratings from Euro NCAP. 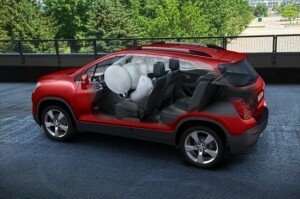 Chevrolet added that Euro NCAP has already raised the bar and made the protocols more stringent to ensure that the cars offer highest safety ratings but amazingly Chevrolet Trax still bags the safety ratings which symbolize the kind of safety features that Chevrolet adds to their vehicles. Susan Docherty President and Managing Director of Chevrolet and Cadillac Europe said that the bold and rugged texture of Chevrolet Trax offers the highest level of safety and the company is proud to get this kind of safety ratings as it indicates the level of professionalism and commitment that goes behind the production of these cars. She said that Chevrolet Trax is a small SUV but it offers lot of features to the consumers that want top class performance and safety. Chevrolet revealed that Trax has managed to get 94% overall score considering all kinds of crash test and protection options that are provided in the vehicle for adults and children.